Fishing been excellent and with all the rain of last week will see more and more great fishing to be had in the region over coming months. 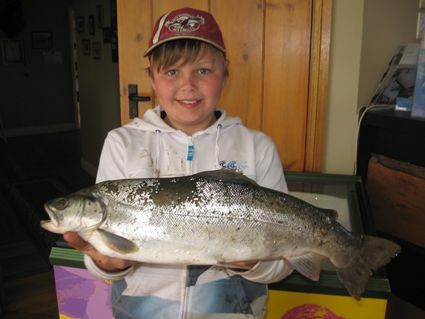 Rivers:- High levels after the rain made fishing a little tougher on the weekend. Fishing prior to this was fantastic and will fish well again as the water recedes. 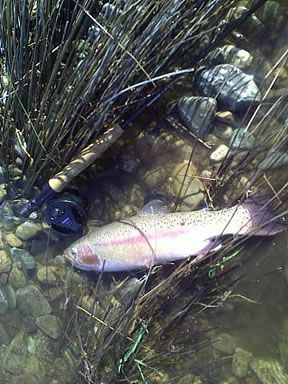 Dry fly fishing will steadily improve as the weather warms this week. *Evan Jardine made the trip up from the South Coast and had a couple of good mid week sessions on the Eucumbene and Thredbo rivers. He fished in the rain and managed some nice rainbows and a brown. A couple of the fish pictured below. *Another South Coast angler, Alan Grey had a seven fish session on the Thredbo in the rain last week. A beadhead black nymph was the best pattern. Lake Eucumbene:- Fly reports have been getting better and better with some nice rainbows being caught searching with wets and nymphs off the bank. Lake Jindabyne:- Jindabyne reports have been varied with some nice fish beng caught though consistancy has been the issue. though there are still the odd good fish to be caught around the edges. The lake now at 77% and rising it looks amazing and the way it is shaping up the fishing will be as good as it was in late 2003. There have been a few brook trout being caught and make a nice by catch when fishing for a bigger brown. The lake which had been dropping and fishing well is now back up to 35% so it will be interesting to see what it does with some warm weather. 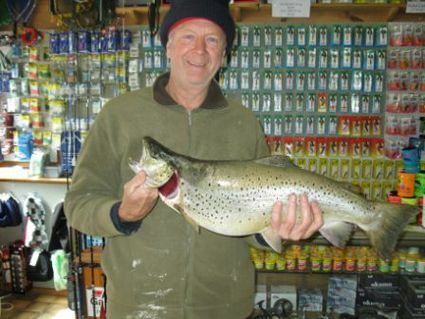 The last report we had was from Adaminaby's Peter Schroder who had a 28 fish session last week. The lake could fire again as it warms and clears. I would suggest it is well worth the look especially if you are fishing the Eucumbene river and want a break from catching river rainbows. I went up to Jindabyne the other night with a couple of mates and stayed for one night. We took the boat and trolled the afternoon around the Creel bay area and only picked up one keeper. We were getting hits on rapalas and red tassies with yellow wings. Fished with bardis and powerbait overnight but didnt get any bites. Trolled again in the morning and picked up a few more fish. Moved on to Eucumbene for the next night and had better luck there, catching 6 trolling in the afternoon and 5 in the evening on bardi grubs. Trolled the following morning and only picked up one despite hooking and losing a couple near the boat. 13 keepers in total for the 2 nights  so not a bad trip. My mate Andrew (in the beanie), caught his first trout and was very excited despite its size. Mudeyes are availabe at time of writing and are going to become a great bait with the warmer weather this week. *Eleven anglers, mostly from Melbourne, and known as Macka's Mob had a good week in the Angler's Reach arm. They landed one hundred and sixty fish between them with some nice browns to 2.5kg early on. Long time veteran of the annual trip, Brian McDowell, had possibly the best trip ever when he set the hook into a this spectacular 5.2kg, 70 cm brown. This fish, as with most of the others, was caught on a scrubworm. As can be seen from the photo below the fish is in absolute prime condition with huge shoulders and a small head. No doubt from the plentiful food supply coming out of the river, soaks and flats in the Angler's reach area. Most of the fish were full of worms that had been washed in during last weeks rain event according to Brian. 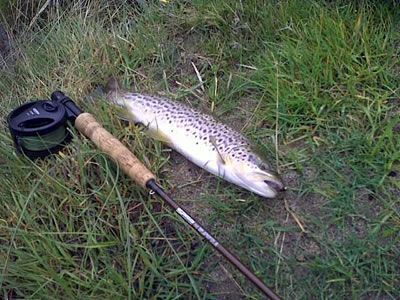 *Mitchell Francis caught this 1.5kg cleaned brown trout on a "mixture of powerbait". He and his dad caught 3 rainbows and 1 brown over the past few days.